Free parking. Easily accessible by car and by public transit. TTC accessible on the 100 Flemingdon bus from Broadview station, the 34C from Eglinton station or the Don Mills 25 northbound from Pape station or southbound from the Fairview Mall station. From Highway 401: Take the Don Valley/404 south to the Wynford Drive exit. Turn right (west) to Garamond which is the first street on the right. From the QEW/Gardiner Expressway: Take the Don Valley/404 north to Eglinton Ave. Proceed westbound to Don Mills Road. Turn north on Don Mills. The first stoplight is Wynford Drive, (Esso station) turn right. Garamond is on the left about 3 blocks along Wynford. If you are staying in town for the show this is the nearest hotel. Below are some views of the action at previous TORONTO POSTCARD CLUB SHOWS. 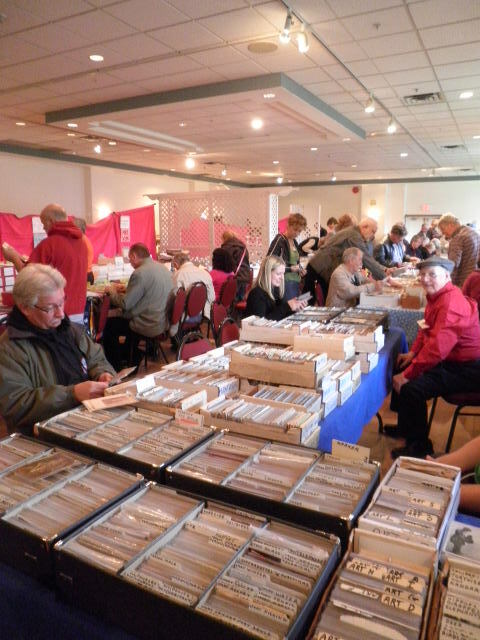 From Canada, the U.S.A. and other countries, there are thousands and thousands of vintage postcards offered for sale in organized boxes. Filed by topic and geography they span the ages from the early 1900’s through the ‘chromes’ of modern times. You are sure to find something that piques your interest. See you at the show! Error: Error validating access token: Session has expired on Friday, 12-Apr-19 20:21:58 PDT. The current time is Friday, 19-Apr-19 21:18:08 PDT.